Image, aka Superior Image, is a 5-year-old black male born July 17, 2006. His sire is Flying Penske and his dam is Annie Binani, making his grand-sire the late, great Molotov. 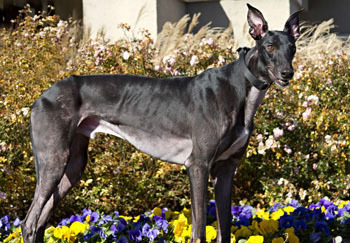 Image has 88 races to his credit on Greyhound-data.com, starting January 8, 2008 and ending on March 4, 2011. Can you Image-ine him in your home? 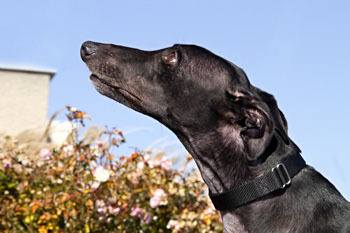 Image was in a home for a few months, but has since returned to GALT through no fault of his own. Image is cat and small dog tolerant. Image is a very sweet dog who loves his neck skritches! If you sit on the floor and scratch and pet him he will put his head on your shoulder and lean into you. He is something of a velcro dog and will follow you from room to room to make sure he doesn't miss anything. He is very people focused. He enjoys a walk in the morning, and he doesn't pull on the leash. He rides in the car nicely as well. He gets along with my greyhounds just fine, and completely ignores the cats. Image has beautiful house manners. He has never marked in the house, does not counter surf, and crates if you toss a treat in for him. He is crated while I am gone during the day. When he first arrived we crated him at night but as soon as he proved to not have any interest in the cats he was allowed to graduate to a dog bed in the bedroom. He sleeps solidly through the night. He is still learning about life with a family so he can be little clumsy about taking treats from your hand and he doesn't quite have the hang of dog toys. He knows he's allowed to play with them but he doesn't seem to like the squeaks they make! He will carry toys around very carefully so they don't make any noise and he places them around the house. He will put two or three toys on the floor near or around a dog bed and then lie down on the bed... very cute!! Once or twice I have heard him vocalize along with passing fire engines! He doesn't bark loudly, but quietly woofs along, listening very carefully. He looks like he is having a very important conversation. 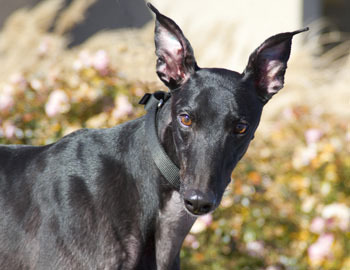 Image is a joy to foster and he will make a wonderful addition to someone's family. Won't you consider giving him a forever home?